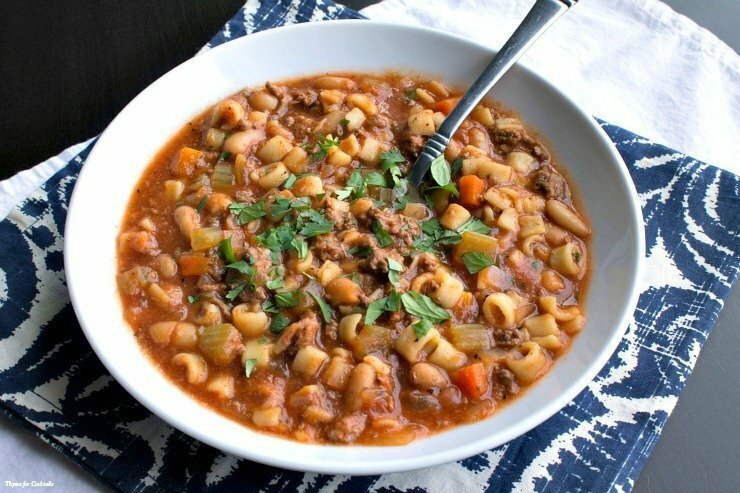 CrockPot Pasta e Fagioli ~ A rich, hearty soup with beef, beans and pasta in a savory broth. 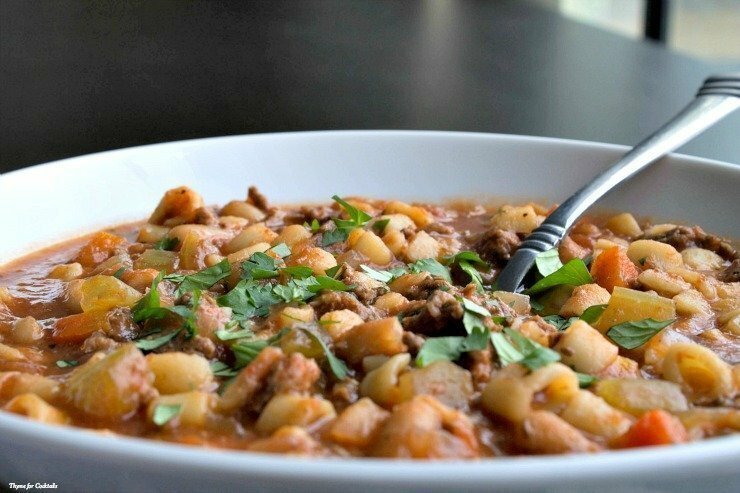 Super easy to make and perfect for cool fall days. Growing up in a rural farming town in Illinois there weren’t many mainstream shopping or dining options. I love the mom & pop restaurants my family visited but it was always a treat to make the drive to a larger city like Peoria or Springfield with my mom and spend the day shopping and hanging out. It was our thing, something to do to get aways from the boys. My step-dad had his own hobbies and my older brother lived in his own teenage boy world of cartoons and video games. One of the things we loved to do was to eat at the Olive Garden. I will readily admit that I was a frequent patron for years, even taking my own son there back in my busy, single corporate-mom days. I could grab take out on my way home from the office and we were set. As a kid I can remember it as being more upscale and less mass-produced chain restaurant. As a woman in my 30’s it was familiar and convenient. Now as a foodie I am less inclined to dine there, preferring to make my own versions of their famous recipes at home. Over the years it was one of the first recipes I taught myself to make, adapting and changing it up time after time. 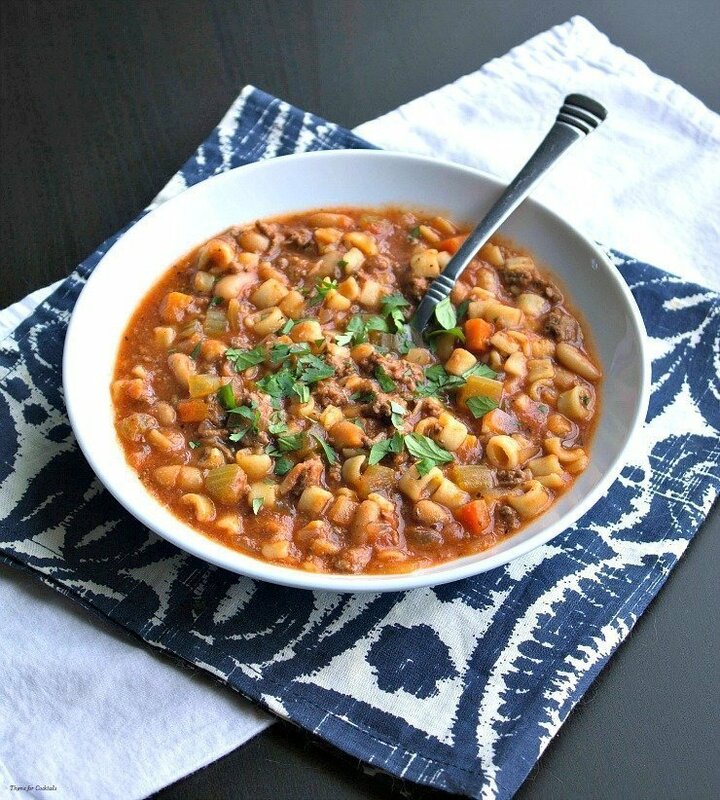 I recently had a real craving for it now that the weather is cooling of in Arizona but didn’t have the time to make it stove top. 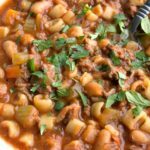 I adapted my standard recipe for the crockpot and was thrilled with the results. The beef bouillon adds quite a bit of saltiness so go easy on adding too much salt. I S&P at the end once the soup is cooked. You can substitute chicken stock it just won’t be quite as beefy. Also I like a thinner soup so adjust amount of stock accordingly. 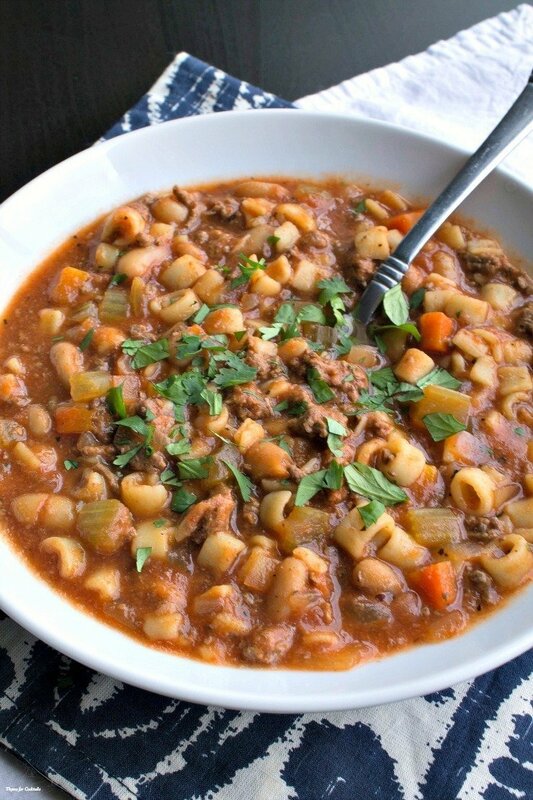 CrockPot Pasta e Fagioli ~ A rich, heart soup with beef, beans and pasta in a savory broth. Super easy to make and perfect for cool fall days. Heat a large non-stick skillet over medium heat. Add beef, break up with a spatula and cook until mostly done. Add to crockpot along with vegetables, seasoning, bouillon, crushed tomatoes and broth. Cook on low 6 hours until vegetables are tender. Salt and pepper to taste. 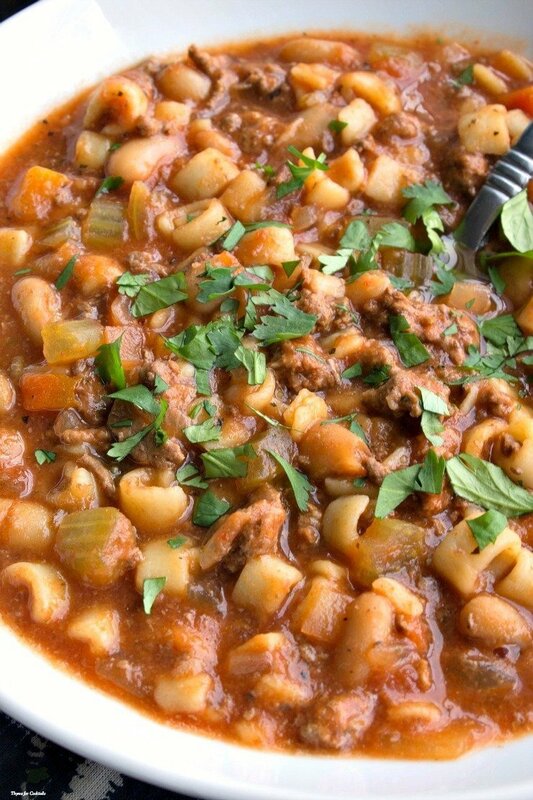 Add beans and pasta. Cook on low another 30 minutes until pasta is cooked. Serve warm. Store leftovers in an airtight container in the refrigerator for up to 3-4 days.